UPPRPB UP fireman recruitment: The last date of the online registration process has been extended by the Uttar Pradesh Police Recruitment and Promotion Board (UPPRPB) on the official website uppbpb.gov.in. Earlier the last date which was February 9, 2019 has been changed to February 16, 2019. The interested candidates are requested to fill the application form. 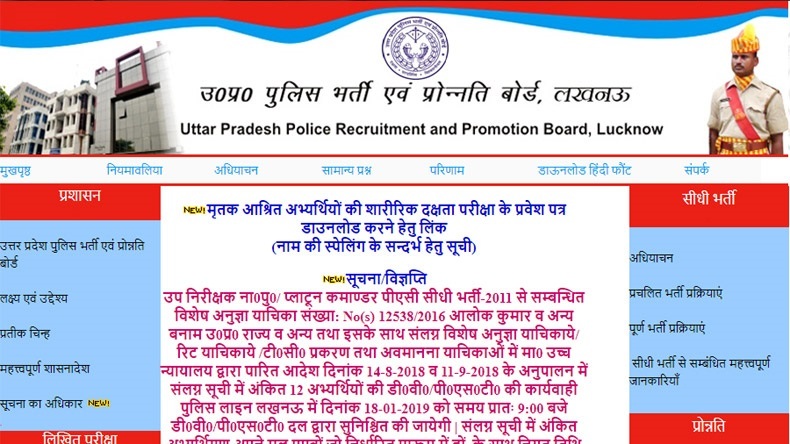 UPPRPB UP fireman recruitment: The Uttar Pradesh Police Recruitment and Promotion Board (UPPRPB) had extended the last date to submit the online application for the post of fireman on the official website uppbpb.gov.in. Prior to this, the last date to apply for the posts was February 9, 2019. Now according to the latest notification, the candidates can apply latest by February 16, 2019. The recruitment notification has been released to fill has been for 2,065 posts. The interested candidates can apply through the official website. The decision has been taken into account after the candidates complained of difficulties in submitting the form online. The Board had received emails and letters from the candidates asking them to provide some time for extending the date. The application process will be closed at 11:55 pm. Step 2: Click on the link ‘UP police fireman recruitment application’ on the homepage. Step 7: Generate the user id with a new password and login id. The qualifiers of the written test will be called for a physical endurance test. According to the official notification, they will be recruited at a monthly remuneration of Rs 21,700 to Rs 69,100.